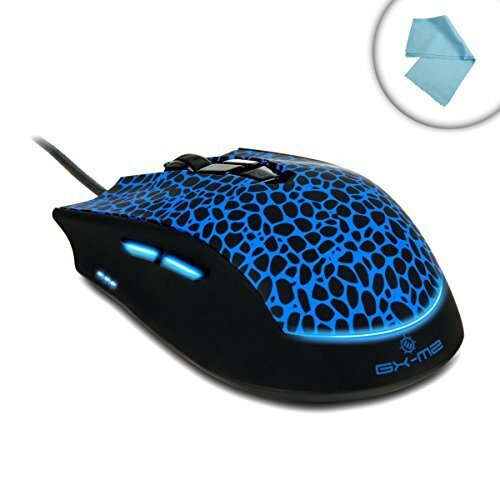 ENHANCE GX-M2 Blue LED Programmable Gaming Mouse. Customize Everything! - Each GX-M2 comes equipped with an interactive software to change everything about the mouse to adapt to your gaming style. You have the power to map buttons , create macros , and adjust DPI , polling rate , sensitivity and many other features! The mouse also comes with onboard memory to save up to 4 custom user profiles for you to seamlessly switch through your different configurations. Ergonomic Profile and Surface - With the GX-M2 , your mouse will feel like an extension of your body after you rest your hands on the ergonomic body frame and rubberized surface. Extend your gaming sessions with stable gripping and a comfortable resting position. Classic Blue LED - The GX-M2 features an alluring blue LED that adds a layer of cool to your room's décor. Just dim your lights and see the glow for yourself! And you're trying to keep a low profile , use the same software you use to adjust your mouse to turn on or off the Blue LED lights. Excellent Pairing With Gaming Desktops. Alienware Steam Machine , Alpha , X51 , Area 51 / Digital Storm Apollo , Aventum 3 , Bolt 3 , Eclipse , Hailstorm II , Slade , Velox , Vanquish 4 / CyberpowerPC Black Pearl , Gamer Xtreme XT , Infinity 8800 Pro SE , Infinity , Mega Special II / CybertronPC Assault , Borg-Q , Gamer Ultra , Lazer , Hellion , Patriot / Lenovo Y900 , Y700 , Erazer X315 / MSI Gaming , AG270 , 240 , 220 / Origin Genesis , Millennium , Chronos X99 and more computers! Backed by 3 Year Manufacturer's Warranty!